"Ancient Reflections on the Nautre of Colour", prof. Michela Sassi (University of Pisa), co-organized with the Institute of Philosophy, Zagreb. Institute of Philosophy, Vth floor, Velika dvorana, 4 pm. Refreshments will be served following the lecture. "Conversations with Socrates - Waiting for Socrates", with Jure Zovko, a dramatic improvisation based on Beckett's Waiting for Godot marks the launch of a new series in the Plato Society Lecture & Colloquia Series. Join the conversation! Refreshments will be served. "Realizam kod Platona i Wittgensteina"
The lecturers will be Prof. dr. sc. Jure Zovko and Prof. dr. sc. Kristijan Krkač. The event will be held on Friday, April 16th in the large auditorium at the Institute for Philosophy Zagreb, Vukovarska 94. "Neoplatonički izvori pseudo-aristotelovske rasprave Liber de Causis"
The lecture will be held by Ivica Mihaljević, M.A. and will be followed by a reception. 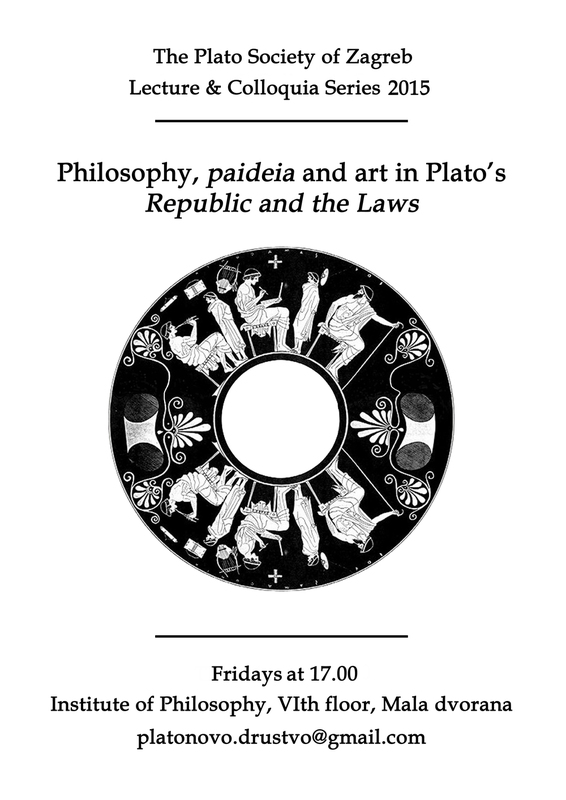 The event will take place on Friday, March 6th starting at 7pm in the large auditorium at the Institute for Philosophy Zagreb, Vukovarska 94.
the Plato Society Lecture & Colloquia Series continues with our weekly colloquia on Philosophy, paideia, and art in Plato's Republic and the Laws. The event will take place on Friday, Feb 23rd starting at 5pm in the small auditorium at the Institute for Philosophy, Vukovarska 94.